A mother of a student of mine once made gingerbread with pears neatly pressed into the top. It was extraordinary. It was years ago, but in the last few weeks I’ve been obsessing on that gingerbread. I will make that gingerbread. Yes, I could call that mom, but that would be too easy. I’ve been pouring over pear gingerbread recipes, and I know I’m going to find it. What am I looking for? A stickiness in the pears- more ginger than molasses, moist but not gooey. Since it is Gourmet Today week, I thought I should start there. 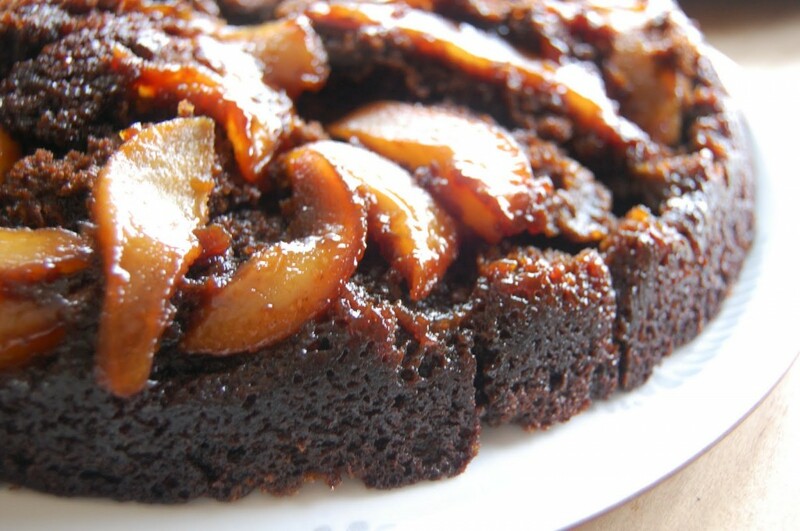 And obligingly, it offers us a pear gingerbread upside down cake. I’m afraid of upside-down cakes. I’m a right-side-up cake kind of girl. I always lose part of the top, and I have to press it back in and try not to cry. There was so much butter on the top of this cake that I thought it might be okay, but I lost a big chunk in the right-side-upping. Never fear, though. The pears are so gooey that they will press right back in without tears. This is not the cake that I am looking for. I’m telling you about it anyway because it might be the cake you are looking for. Are you looking for more molasses than ginger? More sticky than cake-y? The satisfaction of baking a cake in a skillet? This one is for you. In fact, I’ve got a whole cake here if you’d like a piece. I’ll make you a cup of tea, and you can tell me about you’re favorite gingerbread recipe. I’m serious if you’re nearby. I have cake for you. Oh gingerbread, I’m not done with you yet. I’ve got six more pears, and lot’s more recipes. Be ready, friends. I’m taking you along on this odyssey. Peel, halve, and core pears. Cut each pear into 4 wedges. Heat butter in a well seasoned 10 or 12 inch skillet over moderate heat until foam subsides. Reduce heat to low, sprinkle brown sugar over butter, and cook, undisturbed, for 3 minutes. 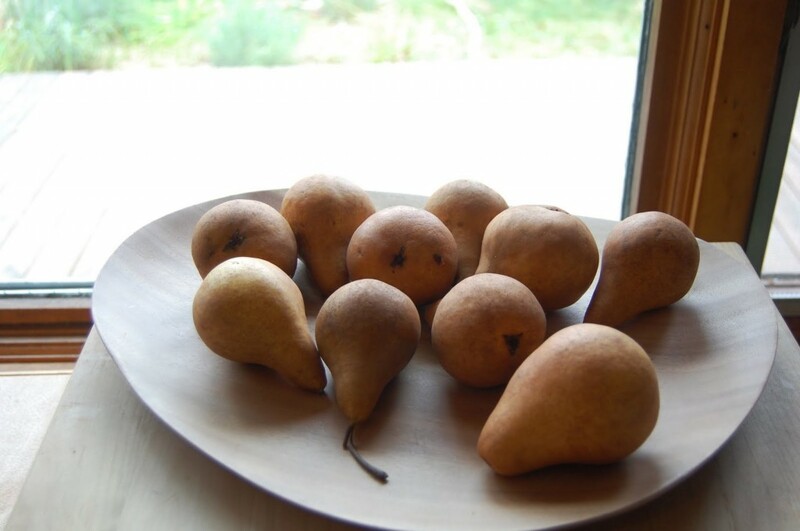 Arrange pears decoratively over sugar and cook, undisturbed for 2 minutes. Remove from heat. Put a rack in the middle of the oven and preheat oven to 350 degrees. Whisk together the flour, baking soda, spices and salt in a bowl. Whisk together the molasses and boiling water in a bowl or large measuring cup. Beat together butter, brown sugar and egg in a large bowl with an electric mixer at a medium speed until creamy, about 2 minutes. Reduce speed to low and add flour mixture alternately with molasses in 3 batches, beginning and ending with flour and mixing until smooth. Pour batter over pears in skillet, spreading it evenly but trying not to disturb pears. Bake until a knife inserted in the center comes out clean, 40 to 50 minutes. Cool cake in skillet on a rack for 5 minutes. Run a thin knife around sides of skillet, invert a large plate with a lip over skillet, and, using pot holders to hod skillet and plate tightly together, invert cake onto plate. 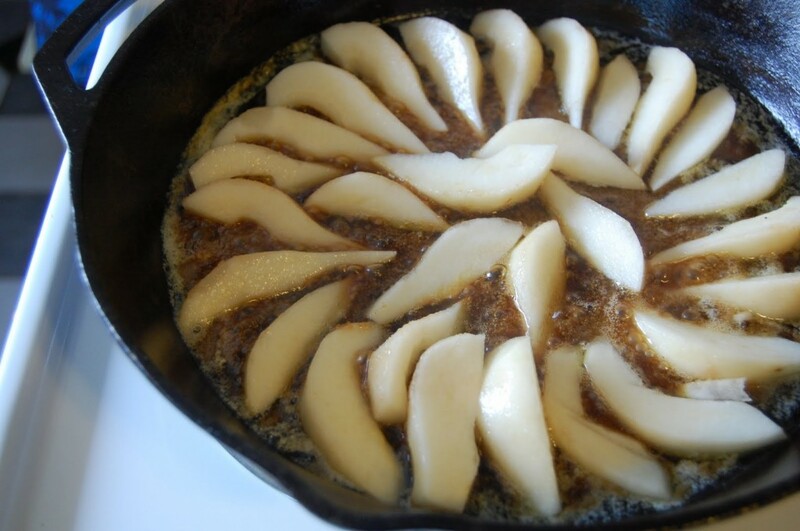 Replace any pears that stuck to skillet. Serve warm or at room temperature, with ice cream or creme fraiche. Hi, for those of us outside the U.S would you be able to tell me the measurement for 1/2 a stick of butter?